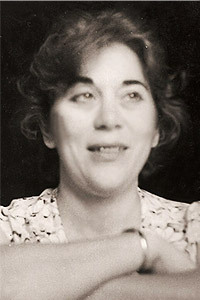 Atiga Izmailova (1932-2006) was one of Azerbaijan's leading ethnographers. She began as a specialist in Talysh culture and society, and later turned to the history of Azeri national dress. Born in Baku, she received her B.A. (Scholar's Degree 1955) in History at Moscow State University, and her Ph.D. (Candidate's Degree 1964) from Moscow's Miklukho-Maklai Institute of Ethnography at the Soviet Academy of Sciences. She worked for many years at the Institute of Archaeology and Ethnography of the Azerbaijan Academy of Sciences, as well as at the National History Museum of Azerbaijan, both in Baku. This website, created and maintained by her family and friends, introduces the life and work of this accomplished scholar. Of foremost interest to visitors may be the Photo Gallery, presenting approximately 500 photographs from Atiga Izmailova's personal collection, focusing on clothing, ornament, architecture, and everyday life among peoples across the former Soviet republic of Azerbaijan.